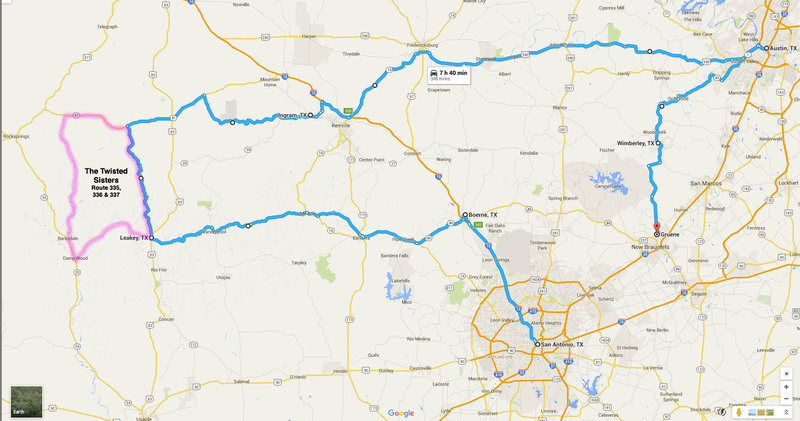 Sabine, our BMW 1200 RT motorcycle, is taking us beyond the Interstate to Texas Hill Country. Known for its Spanish and German fusion culture, Hill Country, is the home of the famous motorcycle ride named the Twisted Sisters. 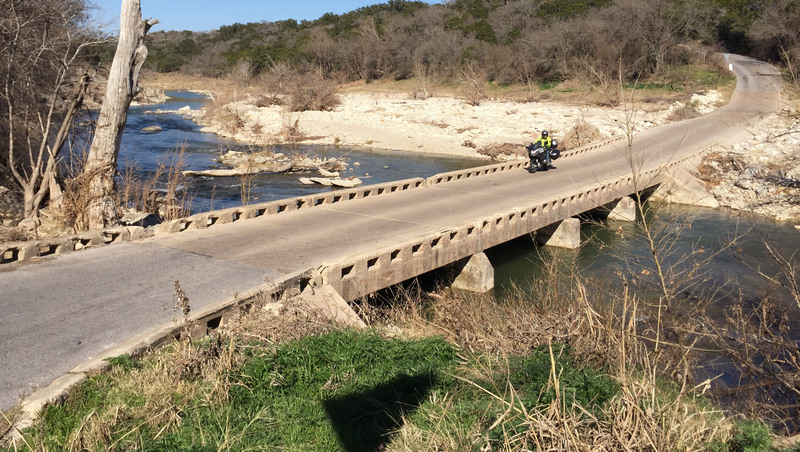 A network of back roads surrounding San Antonio and Austin take riders through tall rugged hills and valleys lined with creeks broken by historic towns. Gentrified life has come to Gruene (pronounced green), Boerne (pronounced born), Ingram and Fredericksburg. Click map to enlarge. Whether you’re riding a motorcycle or traveling by car, the blue route which we somewhat followed, is a great sightseeing route through Texas Hill Country with plenty of restaurant and coffee stops. The pink route is the Twisted Sisters. It is windy, narrow and dangerous. So don’t be crazy. Once upon a time, a cotton gin was the center of life in Gruene. Today, in summer, Gruene is alive with the screams of toobers, as they are known locally, floating down the Guadalupe River. 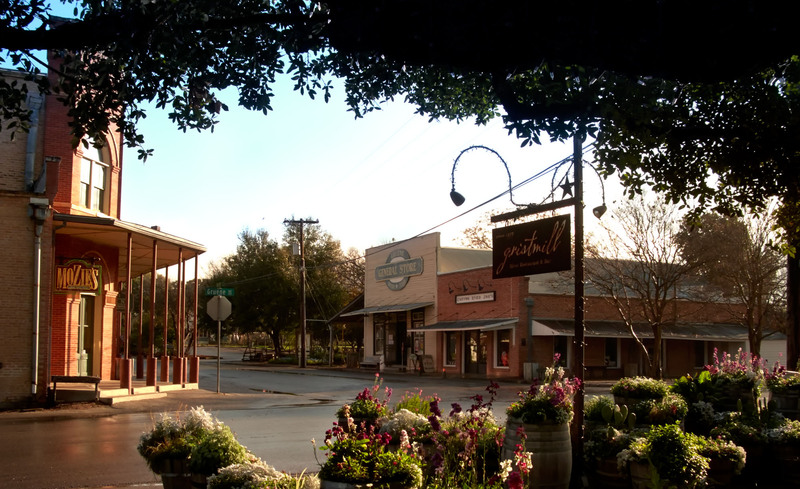 Settled and developed by a German farming family, Gruene, nestled along the river, was revived by two Texans with vision, Pat Molak and Mary Jane Nalley. Henry Gruene, the son of the original settlers planted cotton, built a Cotton Gin and a town sprouted. A mercantile store came in 1878. The family home is the charming Gruene Mansion Inn with more rooms in the barn, under a canopy of trees overlooking the river. Gruene Hall, the oldest, continuously operating dance hall in Texas is virtually unchanged from its original construction in 1878. There’s a band every night, we were there on a Wednesday. Henry died in 1920. Boll weevils and the Depression killed the town, ghosts reigned for 50 years. 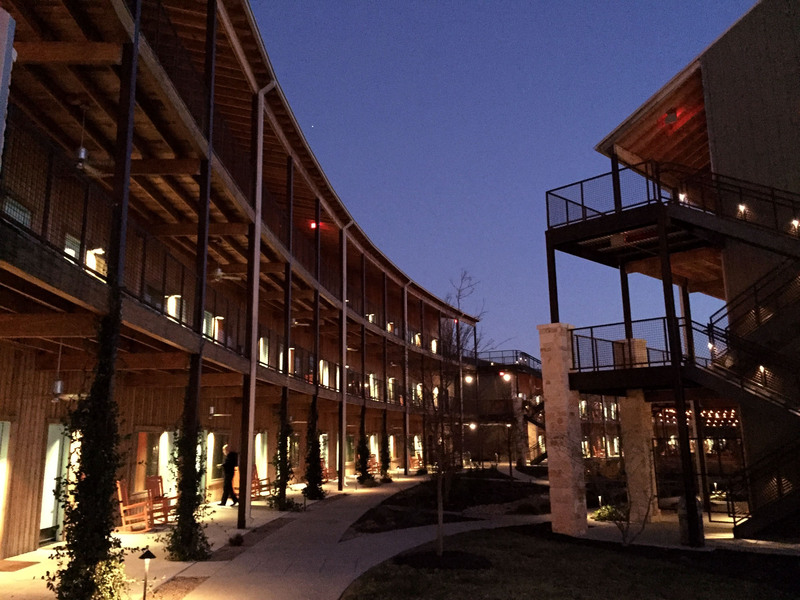 In the 1970s, the estate was sold, redevelopment started with the Gruene Hall. Virtually unchanged since its construction the same year the mercantile store opened, it is Texas’s oldest, continuously operated dance hall. It is MacGyver’s second favorite after the Whiskey River Saloon near Lafayette, Louisiana. Music, inner toobing, shopping and eating are all reasons to visit. Guests staying in the rooms in the converted barn on the Gruene Mansion Inn property enjoy the view of the tree-lined Guadalupe River. The main house with a wide sweeping balcony, Henry Gruene’s family home built in 1878, is on the street side of the property. In February we cruised along the river to Canyon Lake, dotted with fly fishermen. “It’s the only time they can fish without hooking a drunken teenager in an inner tube,” MacGyver deadpanned into my helmet headset. From Gruene we traveled to Boerne, the three Twisted Sisters beckoned. A world renowned motorcycle ride brings people to test their skills. Winding, narrow and dangerous, there are twin perils. Signs note the road’s death toll and there are five foot high yellow gauge sticks planted at every creek crossing warning of catastrophic flash flooding. We traveled one Twisted Sister. MacGyver knew the entire circuit was too much for me. Next time he can leave me shopping in Fredericksburg and do the other two alone. Texas Hill Country, between San Antonio and Austin, is a motorcycle must ride. Not only are there winding narrow roads between the tall rugged hills and the deep valleys, but many of the historic towns have been re-imagined and rejuvenated. That’s MacGyver riding Sabine. Feeling a cranky wife on the pillion seat behind him, we pulled into Ingram and happened upon Chi-Cho’s Cafe with its outside deck. Tables and chairs made of reclaimed wood under the building’s porch. If we’d come from the other direction we would have missed this gem. Delicious sandwiches accompanied by a five-star restaurant worthy salad, field greens, tomatoes, cucumber tossed with a grapefruit vinaigrette plus homemade, thick-cut, crisp-not-greasy potato chips. Delicious and unexpected. This year, my husband, who claims “every day is Valentine’s Day” and ignores the event, had a surprise. Last year, because freight sucked and our truck and trailer required much work, we did not have enough Hilton stays to retain our Diamond status. Good Luck, Bad Luck, we said and decided to take advantage of untethering ourselves from the Hilton Honors bonds and experience different hotel properties. A Texas-sized, not-so-mini mini-bar. A SMEG for your design hounds. MacGyver booked us into two nights at the Lone Star Court in Austin. A new development on the north end of the city, near a Whole Foods, and oddly next to a mall. Styled to be hipster meets old west, I loved it. 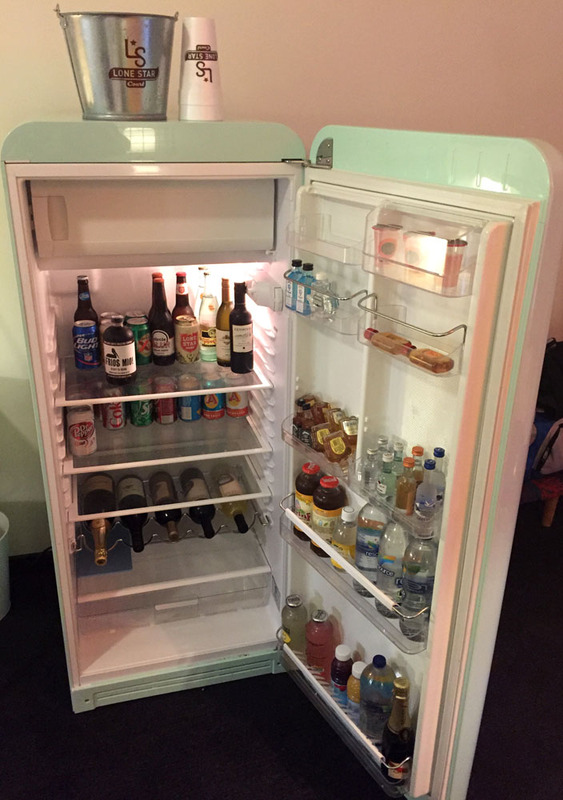 The barn door into the bathroom, the giant shower, the SMEG fridge that is the Texas-size mini bar. Outdoor seating areas and live bands performed at dinner. Surprisingly, we’re still tethered to Hilton for two reasons. One, we don’t know how this happened and I’m afraid to mention it, but we still have our Diamond status. And two, traveling off the beaten track, we find there are more Hilton properties than local hotels and inns. On our last night in Austin, MacGyver had one more surprise, a one-of-a-kind spectacle — the largest urban colony of bats anywhere. Between March and November, when the sun goes down, millions of bats emerge from the Congress Street bridge, over the Colorado River in downtown Austin, for their nightly feast, eating four million pounds of insects a year. The winter has been so mild that on Valentine’s Day, a day with a high temperature of 78, on cue, at sunset, the bats launched, swooshing from the bridge cracks, dotting the deepening night sky. 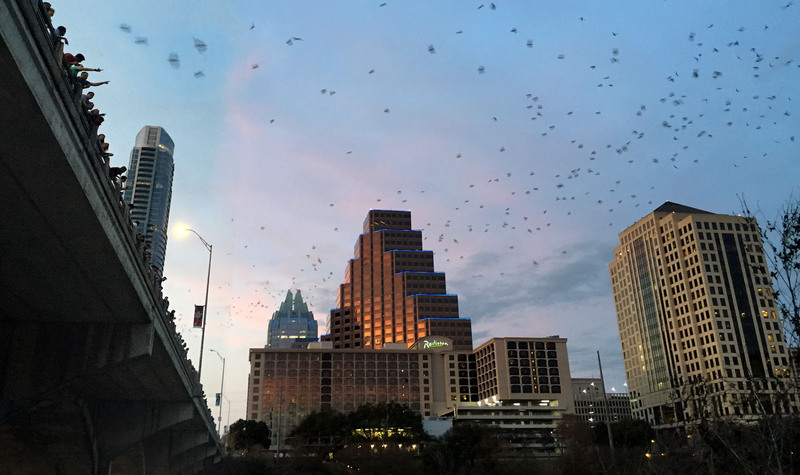 Downtown Austin is home the largest urban colony of bats. It’s an unusual but spectacular tourist attraction. Between March and November when the temperatures are right, the bats emerge nightly at sunset to feast on Austin’s bugs. Last stop on our circle tour was Wimberley, another great, cute Texas tourist town of restaurants, art galleries and shopping. We were told this is the home of the Boot Whisperer who stocks hundreds of pairs of vintage cowboy boots. We planned to visit Fredericksburg and Luckenbach, but a load alert came in. A hot StepDeck Conestoga load worthy of a trek to snow country. Truly, fall-off-the-bone tender ribs at The Gristmill in Gruene. Order it with the al dente green beans, roasted tomatoes and parmesan and mashed potatoes , $14. The Lone Star Court hotel on the north-end of Austin. It’s new construction but it has the feel of reclaimed buildings with a giant courtyard and lots of places to sit and enjoy the new, old west. Lunch-only, Chi-Cho’s Cafe in Ingram is a gem. Fresh ingredients, beautifully presented. Sit on the porch surrounded by flowers. Sandwiches or tacos with side salad $10-$12. There is an extensive menu at Gruene Coffee Haus, 16-ounce latte, $3.75. Large black Texas Pecan roast, $2.15. Because they were sold out of almost everything at Enoteca on South Congress St., at 2:00 PM on Valentine’s Day, I ordered something I normally would avoid at brunch. The Finocchio Di Maiale with fennel-roasted Kurobuta pork, green tomato mostarda and arugula on ciabatta, $13, is sweet, savory and superb. 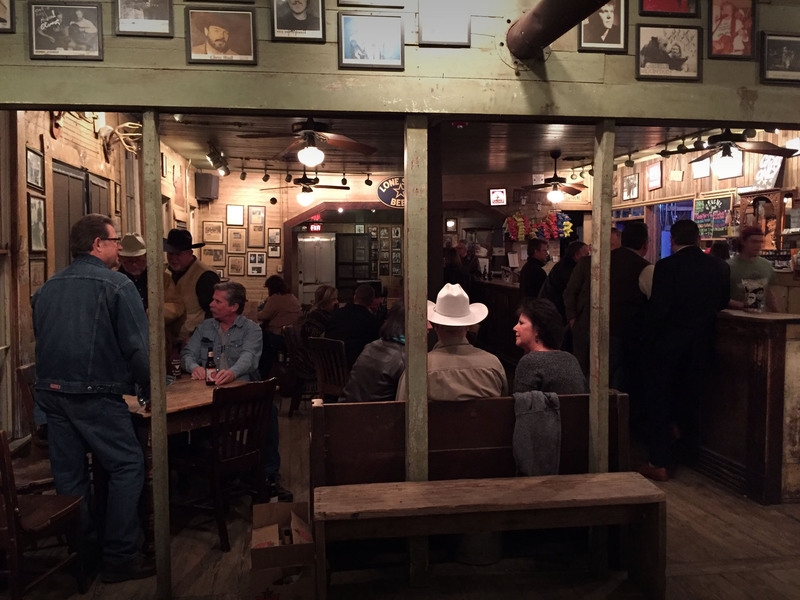 Inside the front door of Gruene Hall is a bar, the music and dancing happens in the back. One room had a fireplace, but I picked the Riverview suite at the Gruene Mansion Inn. Mid-week, off-season, including a hot buffet breakfast, our room was $169.50. The Lone Star Court in Austin has a pool, loaner bicycles and a casual take-out grill in an Airstream trailer. Two nights in our second-floor room, including breakfast was $363 with all taxes. Friday’s rate was $144, Saturday’s $171. 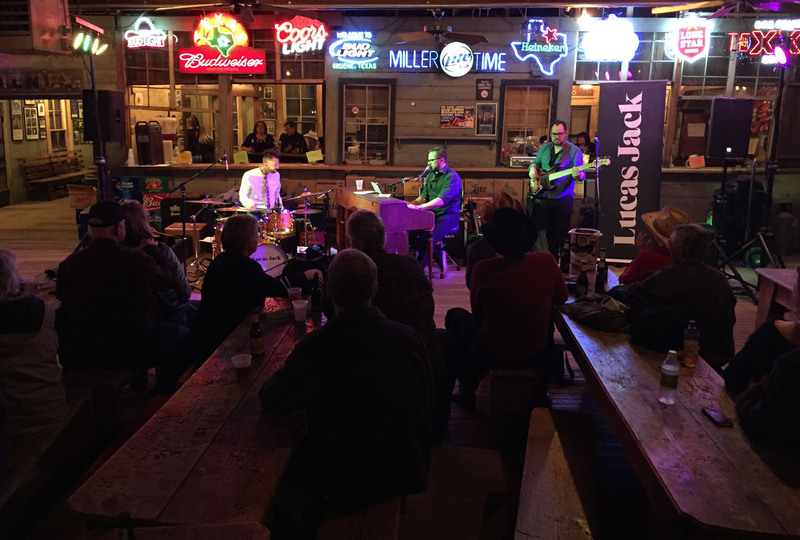 Visit Gruene Hall for locals and legends. Willy Nelson appeared in November 2014. Great blog as usual….I enjoyed, learned and yearned !! It’s a great drive, lots of little places to poke around. Nicer tables than Whiskey River, but it’s missing the Christmas lights and taxidermy. Whiskey River is the gold standard for character.